Summary: Because of her family’s poverty during the Great Depression, Lydia Grace Finch is off to the dull city to stay with her uncle, a baker who never smiles. With her she brings her passion, flower seeds. 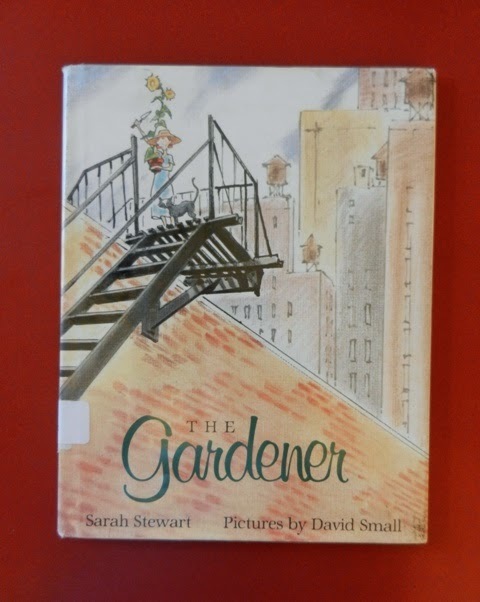 Through her gardening, Lydia’s new friends and city are transformed, gradually brightening the bake shop, then her secret place, the roof top. The text is a series of letters emphasizing the bonds that Lydia Grace still has with her parents and grandmother. Hanna’s Comments: This book, like its Dynamic Duo partner offered tomorrow, Miss Rumphius, is all about spreading joy with flowers. Leaving marks of beauty and love in concrete ways and with a spirit of generosity & vocation that is transformational is the powerful theme here. Also highlighted is a generational legacy that Lydia Grace’s grandmother has instilled in her. This legacy is a love of gardening which can serve as a discussion tool for exploring possible legacies that are left to next generations.